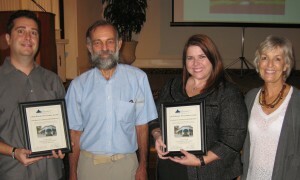 Pinstripe Marketing was presented with a Historic Preservation Award for Excellence in Commercial Rehabilitation from St. Petersburg Preservation on October 19, 2010. The award was presented for Pinstripe’s role in initiating the rehabilitation of the historic Crislip Arcade and 600 Block of Central Avenue in downtown St. Petersburg. Shortly after moving the agency to the 600 Block in late 2007, Pinstripe led the effort to refurbish the vacant and blighted Crislip Arcade and adjacent buildings. Following a meeting with the building’s owner, Tom Gaffney, Pinstripe coordinated a clean-up initiative with more than 70 volunteers and started planning an exterior art project. With increased momentum and interest in the project, Councilwoman Leslie Curran, several departments within the city, St. Petersburg Preservation, and local businesses including J Allan Studios and Studio@620, joined the initiative and worked closely with Gaffney to re-develop the arcade as a home for emerging artists, galleries and small businesses. The grand re-opening of the 600 Block was held on April 5, 2010 and now houses more than 20 businesses.